90 runners. 4 porta-potties. 1 tent. 0 corporate sponsors. You can register at the event, and local families volunteer to hand out water. Your goodie bag includes your bib number, a crab shaped lollipop, a T-shirt that is wearable and is handed to you by a lady with a lovely smile. Local charm is everywhere and you can’t help but to find your happy face despite having been up since 0400. It was our first adventure traveling via our “Adventure-Bus” – a modern day version of a VW Bus equipped with a lounge couch, mini-fridge and storage to hold our post-run treats. On the back of the ‘bus” held our bicycles. Our support team – Paddy, Chuckster and Riley (the golden retriever) were not deterred by the 4AM wake up call and were part of the adventure fun. With all the stars aligned – we had to turn the Kent Island run into a day trip. But first, we must run. A lovely lady shouted “Go” and by 8:10AM – all 90 of us were trotting along a trail through Matapeake State Park. A few runners were serious. They had PRs to break, and were long gone from eyesight. Then, there are the rest of the runners. The remaining runners fall into two categories. The gaspers and the chatters. My running partner (Lois) and I (Doris) moved right in with the gaspers. This is what happens when we run too fast right from the gate. This is what happens when your Garmin doesn’t work and you think you should run faster to catch a satellite. This is what happens when you start chasing the runners ahead of you for no good reason. This is what happens when you think you can run faster because the terrain is flat. You become a gasper, and you aren’t particularly concerned. This is what happens on island time. As gaspers, this means that we do not have any conversation while running, and any chatter is limited to one or two barely recognizable moans. At one point, Lois moaned and pointed to something atop an old farmhouse. She thought it was a bird. I looked and tried to see the bird, but with tears in my eyes and lack of O2 in my lungs, decided that Lois had gone blind in her gasping state. To me, the object looked like a palm tree on top of the farmhouse. I didn’t have the energy to disagree. I nodded in agreement. It was easier that way. And then, the palm tree on top of the farm house flew away. I don’t know what kind of birds are bred on Kent Island, but this one surely escaped from Jurassic Park. Suddenly the Lois and Doris roadshow kicked up the running pace another notch. We ran along the shoreline of the Chesapeake Bay, through a lovely residential neighborhood, and then back along the trail to the finish line. We took all the scenery in while in super oxygen deficit – while keeping a 3rd eye on heightened alert for flying palm trees. 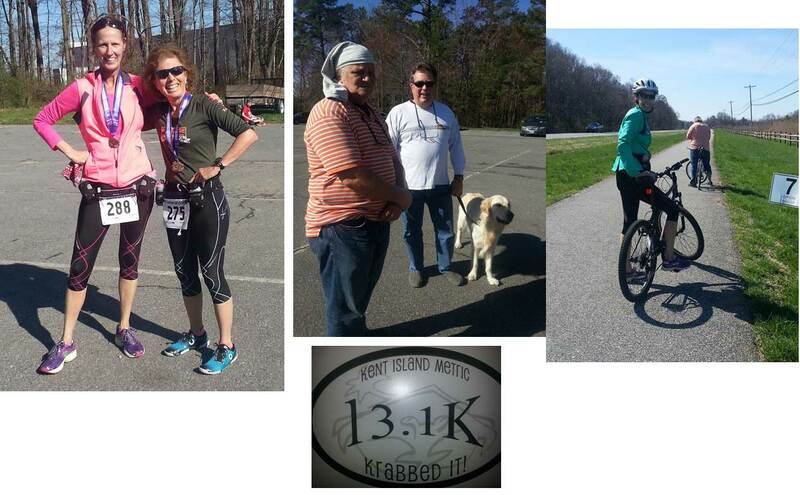 13.1 metric miles completed – and one very large prehistoric bird avoided. Reunited with our support team, we moved on to phase 2 of our adventures. More exercise of course – and this time with wheels. We hopped on our bicycles and aimlessly wandered along the trails and roads of Kent Island. Life is good on island time. The flying palm tree was nowhere to be seen. And that was just as well. Who would believe us anyway?